Note: Sometimes back I came across Google Street View of a beautiful Cherry Blossom tree in Japan called Miharu Takizakura. A search on the WWW revealed that that it was one of the three Cherry Blossom trees in the Japan which are more than thousand years old. A further search for oldest Cherry Trees in World always showed these three cherry trees, this leads me to conclude that these three trees are not only the oldest in Japan but also oldest in the World. This post is about these millennium club trees. Cherry Blossom trees are one of the most beautiful ornamental trees in the World. Its profuse pink and white blooms which cover nearly the entire tree are a treat to watch. The Cherry Blossom or Sakura has a special place in Japanese traditions and culture. It is revered by Japanese and it is their unofficial national flower. Japanese have a tradition of celebrating Hanami (meaning "flower viewing") under the Sakura when it starts blooming in March/April each year. Till about 8th century the Japanese used to celebrate Hanami under the plum blossom (ume) trees but sometime in 8th century they also started celebrating under Cherry Blossom and nowadays Hanami is mostly celebrated under Cherry Blossom trees. Cherry Blossoms trees can be found almost every where in Japan namely along the road sides, rivers, in and around parks, schools and specially in the temple complexes. The country boasts of about 200 varieties. The average lifespan of a cherry tree is about 20 years but some trees have attained age of two/three hundred years. 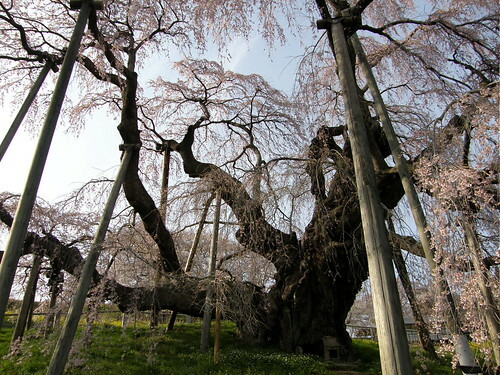 However three remarkable trees in Japan have reached an amazing age of 1000 years or more. 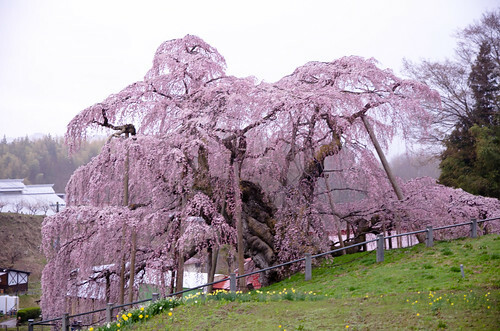 These are the longest surviving cherry trees not only in Japan but also in the World. Miharu Takizakura, in Miharu, Fukushima prefecture, Japan - Age about 1000 years. Usuzumi Sakura in Neo, Motosu, Gifu prefecture, Japan - Age about 1500 years. Jindai Sakura, Yamataka, Hokuto, Yamanashi Prefecture, Japan - Age about 1800-2000 years. Brief details and images of each are given below. This cherry blossom (sakura) tree located in Miharu town in central Fukushima, is considered by many as the most beautiful cherry blossom tree in Japan. "Takizakura" literally means "waterfall cherry tree" - A name given to it due to its wide drooping branches which looks like a cascading waterfall. The 12 meter tall tree with a spread of about 25 metres and trunk circumference of about 9.5 meters is estimated to be over 1,000 years old. It is a popular tourist destination and about 300,000 people visit it every year. 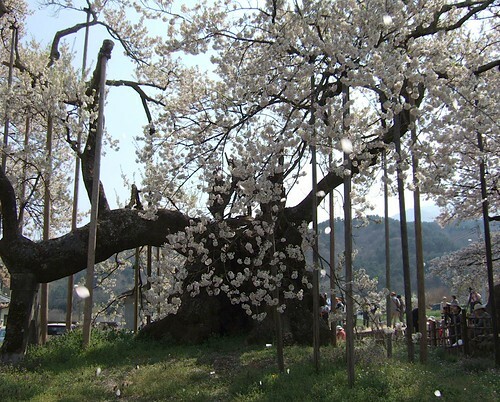 The town of Miharu had suffered badly in the Great Tsunami and Earthquake of March 2011 but amazingly the tree survived and was in full bloom within a month of the tragedy. For the Japanese people it became a symbol of resilience, hope and reconstruction. 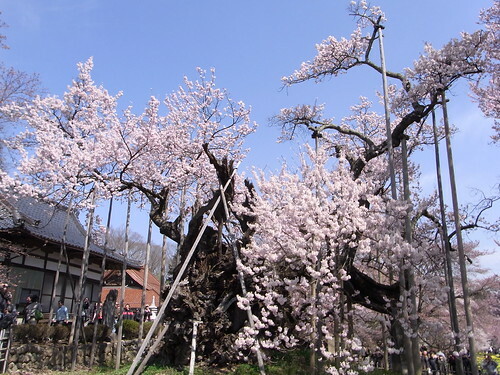 This cherry blossom (sakura) tree in Motosu, Gifu Prefecture is over 1,500 years old. As per the historical records the tree was planted in early sixth century by Emperor Keitai. The tree is 17.2 meters is high with a girth of 9.2 meters. The buds of this tree are a soft pink which gradually become white as the flower blooms and finally turns pale grey when the flowers fall down, hence the name Usuzumi which translates into "pale black ink". 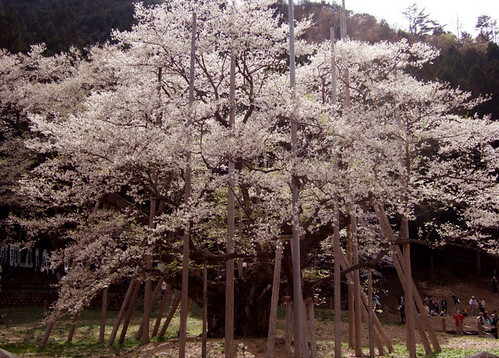 This cherry blossom (sakura) tree located in Jisso-Ji Temple complex in Yamataka is estimated to be 1800-2000 years old. As per local folklore it was planted by the 12th emperor of Japan who ruled until roughly 133 A.D. It's name Jindai means "divine generations". The tree has a height is about 10.80 metres and girth of about 11.80 metres.